FAIRLESS HILLS, PA --Undefeated welterweight contender Mike Jones, of Philadelphia, PA, opened up his training camp at the 10th Round Gym in Fairless Hills, PA, last week in preparation for his Nov. 13 fight with Jesus Soto-Karass at Cowboys Stadium in Arlington, TX. The Jones vs. Soto-Karass fight opens up the pay-per-view telecast that night on a card which features Manny Pacquiao vs. Antonio Margarito for the vacant WBC junior middleweight title in the main event. Among Jones’ sparring partners are fellow-Philadelphians Gabriel Rosado and Raymond Serrano. Rosado (14-5, 8 K0s) is on the verge of his own world ranking at junior middleweight while Serrano (13-0, 6 K0s) is quietly moving up through the welterweight division. 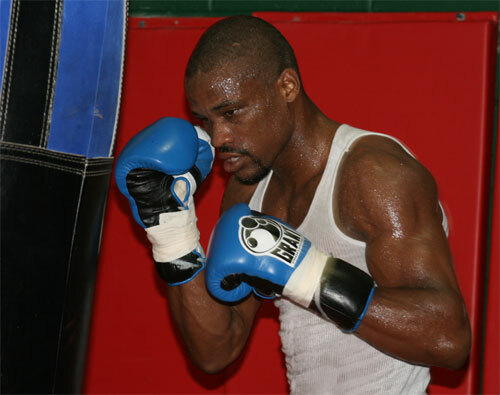 Jones also has been working with unbeaten junior welterweight Ronald Cruz (9-0, 6 K0s), of Bethlehem, PA.
A pro since 2005, the 27-year-old Jones is ranked between No. 2 and No. 4 by all four major world sanctioning bodies. At stake in this scheduled 10-rounder will be Jones’ NABA and NABO welterweight belts. Other major fights on the PPV card include: Kelly Pavlik, of Youngstown, OH, vs. Bryan Vera, of Austin, TX, 10 rounds, super middleweights; Guillermo Rigondeaux, of Miami, FL, vs. Ricardo Cordoba, of San Miguelito, Panama, 12 rounds, super bantamweights.